Dominik Ritszel was born in 1988 in Rybnik. He studied at the Faculty of Graphics in the Institute of Arts at the University of Silesia in Cieszyn and at the Academy of Fine Arts in Katowice, where he did graphic arts. His works were exhibited, among others, at international video art festivals Les Rencontres Internationales (Gaîté Lyrique, Palais de Tokyo, Paris), Proyector, International Video Art Festival (Spain, Italy, Portugal) and Video Art Review THE 02. He participated in group exhibitions - in the Show Off Section at the Krakow Photomonth Festival (2013), The increased Difficulty od Concretation in Prague (2015), What’s Hidden in National Gallery of Art (2015), Curators Network in the Museum of Contemporary Art (MOCAK) in Krakow (2012), Mum, I just really need to focus on my art right now in the Arsenał Gallery in Poznan (2012), among others, and in a joint exhibition presenting works of young Silesian artists Milk Teeth in the BWA Contemporary Art Gallery in Katowice (2013). He had individual exhibitions in the Centre for Contemporary Arts Kronika in Bytom, in Grey Gallery in Cieszyn, Grey House Gallery in Krakow and in the Silesian Museum in Katowice. He was chosen among the three finalists of the Talenty Trójki 2013 contest in the Visual Arts category, he was short-listed for the Grey House Foundation Prize. In 2014 he was granted the Young Poland Programme scholarship. In spring 2014 as an artist in residence he stayed in the A-I-R Laboratory in the Centre for Contemporary Art Ujazdowski Castle where he produced Versus, showed in Bank Pekao Project Room in Warsaw. In 2015 he participated in group exhibition Waiting for better times Curatorated by Magda Kardasz (Zachęta Project Room, Warsaw). During of the 8th edition of Biennale of Young Artists RYBIE OKO his video Reverb received special award. He has been crowned the 2015 winner of the Young European Artist Trieste Contemporanea Award. His next individual exhibition will take place in Studio Tomaseo (Italy) 26th of March. "Night Time (extended)" - Hans Op de Beeck 2015 Full HD video, black and white, sound, 2015 (19 minutes 20 seconds) ‘Night time (extended)’ is a dark, enigmatic animation without text based on a large series of monumental monochrome watercolours which Op de Beeck steadily realised over the past five years, in between all his other multidisciplinary projects. All the watercolours were painted by the artist at night in complete solitude and concentration.This nightly atmosphere is a tangible presence in the metropolitan landscapes, the images of nature, the buildings, interiors and characters which the artist brings to life in the film. "Night time (extended)" is conceived as a mysterious dream in which all proportions, perspectives and environments are fictitious. In this way, intimate close-ups are made to alternate with sweeping images; every image clearly and visibly the product of deliberate construction. The film is comforting and soothing, yet also exudes a sense of dormant danger and derailment, just as in the film noir tradition. Here, Op de Beeck brings together an anachronistic whole of both classical and distinctly contemporary themes into an effortless blend of both highly cultivated and more visceral subcultural elements. 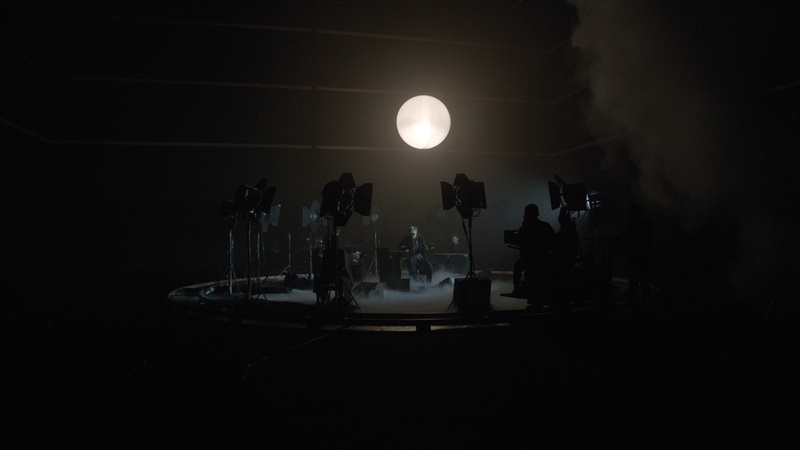 Hans Op de Beeck produces large installations, sculptures, films, drawings, paintings, photographs and texts. His work is a reflection on our complex society and the universal questions of meaning and mortality that resonate within it. He regards man as a being who stages the world around him in a tragi-comic way. Above all, Op de Beeck is keen to stimulate the viewers’ senses, and invite them to really experience the image. He seeks to create a form of visual fiction that delivers a moment of wonder and silence. Over the past fifteen years Op de Beeck realized numerous monumental ‘sensorial’ installations, in which he evoked what he describes as ‘visual fictions’: tactile deserted spaces as an empty set for the viewer to walk through or sit down in, sculpted havens for introspection. In many of his films though, in contrast with those depopulated spaces, he prominently depicts anonymous characters. Hans Op de Beeck was born in Turnhout in 1969. He lives and works in Brussels and Gooik, Belgium. Op de Beeck has shown his work extensively in solo and group exhibitions around the world. He had substantial institutional solo shows at the GEM Museum of Contemporary Art of The Hague, The Hague, NL (2004); MUHKA Museum of Contemporary Art, Antwerp, B (2006); Centraal Museum, Utrecht, NL (2007); the Smithsonian’s Hirshhorn Museum and Sculpture Garden, Washington DC, US (2010); KunstmuseumThun, CH (2010); Centro de Arte Caja de Burgos, Burgos, ES (2010); Butler Gallery, Kilkenny, IRL (2012); Kunstverein Hannover, D (2012); Tampa Museum of Art, Tampa, USA (2013); the Harn Museum of Art, Gainesville, FL, USA (2013); FRAC Paca, Marseille, F (2013); MIT List Visual Arts Center, Cambridge, Boston MA, US (2014); MOCA Cleveland, OH, US (2014); Sammlung Goetz, Munich, D (2014), … Op de Beeck participated in numerous group shows at institutions such as The Reina Sofia, Madrid, ES; the Scottsdale Museum of Contemporary Art, AZ, US; the Towada Art Center, Towada, JP; ZKM, Karlsruhe, DE; MACRO, Rome, IT; the Whitechapel Art Gallery, London, GB; PS1, New York, NY, US; Musée National d’ArtModerne, Centre Pompidou, Paris, FR; Wallraf-Richartz Museum, Köln, DE; Hangar Bicocca, Milano, IT; the Hara Museum of Contemporary Art, Tokyo, JP; 21C Museum, Louisville, Kentucky, US; The Drawing Center, New York, NY, US; Kunsthalle Wien, Vienna, AT; Shanghai Art Museum, Shanghai, CN; MAMBA, Buenos Aires, AR; Haus der Kunst, Munich, DE; Museod’ArteModerna di Bologna, Bologna, IT; Kunstmuseum Bonn, Bonn DE, … His work was invited for the Venice Biennale, Venice, IT; the Shanghai Biennale, Shanghai, CN; the Aichi Triennale, Aichi, JP; the Singapore Biennale, Singapore, SG; Art Summer University, Tate Modern, London, GB; the Kochi-Muziris Biennale, IN, and many other art events. L’objet de Meurtrière c’est La Chose. La Chose est insensée, folle, intenable, hystérique, grotesque, phobique, dangereuse, brutale, dévorante, sauvage, sexuelle, imprévisible, sidérante, frénétique, atroce, inquiète, effrayante, extatique, désirable, vulgaire, perverse, embarrassante, impudique, nerveuse, obscène, sacrée, sacrifiée, furieuse, meurtrière. Mais avant tout, La Chose est sans intention. Avec les danseuses : Émilia Giudicelli, Vilma Pitrinaite, Hélène Rocheteau, Francesca Ziviani. Le travail de Philippe Grandrieux s’étend sur de nombreux territoires : fiction de long métrage, expérimentation télévisuelle, art vidéo, film de recherche, documentaire, installation. Son exigence artistique le mène à pousser chacun de ses domaines à leurs limites et se montre constamment inventive et radicale. Ses trois films de long métrage, Sombre (récompensé au festival de Locarno), La Vie nouvelle (présenté à la Tate Modern de Londres) et Un lac (primé à la Mostra de Venise) font référence en termes de photographie, de travail sur le son, d’expérimentation narrative et figurative. Sur des trames narratives pourtant linéaires voire sérielles (souvent le conte, la légende), ses films déploient un monde d’énergies, ancré dans les sensations et les affects. Depuis 2005 , ses fictions de long métrage, installations, documentaires, expérimentations télévisuelles, suscitent de nombreuses programmations monographiques. En janvier 2011, il réalise un portrait du cinéaste japonais Masao Adachi, premier portrait d’une série imaginée par Nicole Brenez et Philippe Grandrieux. Il se peut que la beauté ait renforcé notre résolution / Masao Adachi est programmé dans près de 50 festivals et universités. Il remporte, en 2011 le « New: Vision Award » au CPH:DOX de copenhague, en 2012 le « Grand Prix Expérimental » au Festival de Pantin et en 2013 le « Grand Prix du Documentaire » au Festival de Tripoli au Liban. En 2012 il entreprend la réalisation d’une trilogie dont l’objet est l’inquiétude . White Epilepsy en est le premier mouvement. Le film sera présenté en compétition internationale au FID Marseille 2012 puis au FICUNAM Mexico, au LINCOLN CENTER New-York, au Festival UNDERDOX Munich, au FNC Montréal... En 2013 le WHITNEY MUSEUM OF AMERICAN ART offre une «carte blanche» à Philippe Grandrieux dans le cadre du festival Walls and Bridges. Les deux premiers mouvements de sa trilogie y seront présentés : la version film de White Epilepsy ( avec 4 danseuses/danseurs) et la version performance de Meurtrière ( avec 4 danseuses). La version film de Meurtrière vient d’être présentée pour la première fois en compétition internationale au FID Marseille 2015 et vient de remporter le prix FNC LAB au FNC Montréal. Il vient de terminer Malgré la nuit, fiction de long métrage, avec Ariane Labed, Kristian Marr, Roxane Mesquida, Paul Hamy. Philippe Grandrieux bénéficie d’une bourse d’étude «The Radcliffe Institute Fellowship Program» à l’Université de Harvard pour l’année universitaire 2015-2016. Le photographe benoit PEverelli cree une scenographie et réalise la mise en image d`une oeuvre poétique et musicale. OPNI: Objet Plastique Non Identifié. Philip Cartelli Philip Cartelli is a filmmaker, critic, researcher, and doctoral candidate in Harvard University’s Sensory Ethnography Lab. His film and video works have been shown in international festivals, conferences, and installation settings. Mariangela Ciccarello After studies in philosophy and visual art, Mariangela Ciccarello pursued a career as a curator in galleries and museums between Europe and South Africa. She has made a series of films over the past few years, most recently during a fellowship at the UnionDocs Center for Documentary Art in Brooklyn. A freighter crosses the ocean. The hypnotic rhythm of its pace reveals the continuous movement of the machinery devouring its workers: the old sailors’ gestures disappearing under the mechanical and impersonal pulse of the 21st century. Perhaps it is a boat adrift, or maybe just the last example of an endangered species with engines still running, unstoppable. Born in Barcelona in 1976, Mauro Herce graduated in engineering and fine arts before enrolling in film school at the Escuela Internacional de Cine y TV in San Antonio de los Baños (Cuba) and the École nationale supérieure Louis-Lumière in Paris. He started his career as a director of photography and screenwriter on such films as Ocaso (2010), Arraianos (2012), A puerta fria (2012), El quinto evangelio de Gaspar Hauser (2013) and Slimane (2013). Dead Slow Ahead (2015) is his first feature film as a director.